How can my flat or sagging cheeks be improved? How can my flat or sagging cheeks be improved without surgery? Voluma is an FDA-approved injectable filler for creating cheek volume, lift and definition. Voluma is injected in the office and only requires a topical numbing cream for comfort. The injection session takes about 20 minutes. The most impressive benefit of Voluma is that this non-surgical in office treatment lasts two years or more! Voluma was introduced in late 2013 and we’re seeing our initial patients back for followup and the filler is still there and continues to create beautiful results. Voluma can be used to add volume and lift sagging or deflating cheeks. Voluma can also be used to improve symmetry in people with cheekbones that are different sizes and/ or shapes (a very common problem). 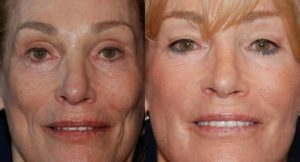 Voluma also softens the nasolabial fold reduding this telltale marker of facial aging. We also see improvement in the tear trough, an area of hollowing at the inner corner of the eye, following Voluma injections. For optimal results, Voluma treatment of the cheeks is frequently combined with Juvederm treatment of the nasolabial folds, Belotero injections in the undereye hollows or Botox treatment of lines and wrinkles in the eye area. If you want the effect of a cheek implant without having to undergo surgery, Voluma is the answer. The most common risks are bruising and swelling that last 2-3 days. While our Denver patients have been very happy with the results of Voluma, it is reassuring to know that this hyaluronic acid filler is completely reversible with Hylenex injections. The best way to ensure great results is to select a properly trained and experienced physician injector. Dr. Weber has been performing hyaluronic acid filler injections since 2008 and Voluma injections prior to its official launch in 2013. He is a National Physician Trainer for Allergan, the company that created Voluma, and has trained dozens of Denver area injectors in the safe use of Voluma. It pays to Trust Your Face to the Expert. To learn more, call us at (303) 792-2224 or email [email protected]/blog to schedule your consultation with Dr. Weber today!